Quinoa is super versatile just like how other popular whole-grains have been. To your surprise, I had never tasted nor did I know how to cook quinoa, until 3 years ago. Quinoa was, to me, an exotic food that I never thought I’d be addicted to. Yes, addicted. It just has a unique texture that brings joy to you in every bite. Don’t believe me? Let’s whip up a batch and see for yourself! Quinoa is a type of plant that is grown for their seeds. For anyone who hasn’t eaten quinoa before, here’s a quick look into it. Quinoa has a toothsome texture that feels a little bit crunchy, yet fluffy, oaty and gluey, with a hint of earthy nuttiness in taste. This unique texture will either add a nice touch to a salad or stand out on its own. Let’s take a look at its nutrition content and find out why quinoa is widely used by dieters! We all know quinoa is high in fiber, minerals, B vitamins, and is a great anti-aging agent with a large amount of antioxidants. But little did everyone know, quinoa is a ‘complete source of protein’, meaning that it contains all nine essential amino acids that are essential in a person’s diet. Among those nine amino acids, lysine is the one that plays the role of growing, repairing, and maintaining tissues. However, the human body cannot produce lysine itself; so, the only way to get more lysine into the body is to consume it through food. Fortunately for us, quinoa is one of the few natural resources that are high in lysine. Rinse the quinoa in water in 5-15 minutes until the water is no longer opaque. Let drain. Bring the quinoa to fry in high heat in 2-3 minutes, then add in 1/2 tbsp olive oil and let sit in 2 more minutes. You can have some extra condiments such as turmeric powder for eye-catching color and appetizing fragrant. Bring the fried quinoa to a saucepan and start cooking in high heat. 3 minutes after that, start stirring and adding in pepper and salt at the same time. When it reaches the boiling point, get a lid to cover and reduce the heat to medium level. Let the quinoa steam for another 15 minutes. Open the lid and stir it all over one last time. Shut down your stove and remove the saucepan from heat. Put on the lid again and let sit for the last 5 minutes before bring to serve. Serve your quinoa versatilely. Sprinkle some pepper flakes, sliced olives or fresh chopped herbs will also help brighten the whole thing up. If you still find it a bit flat in taste, then some additional drops of soy sauce going in can always stimulate your appetite big time. Quinoa grains may cause bitterness sometimes if not rinsed carefully. This is because of the saponins that occur naturally outside of them. 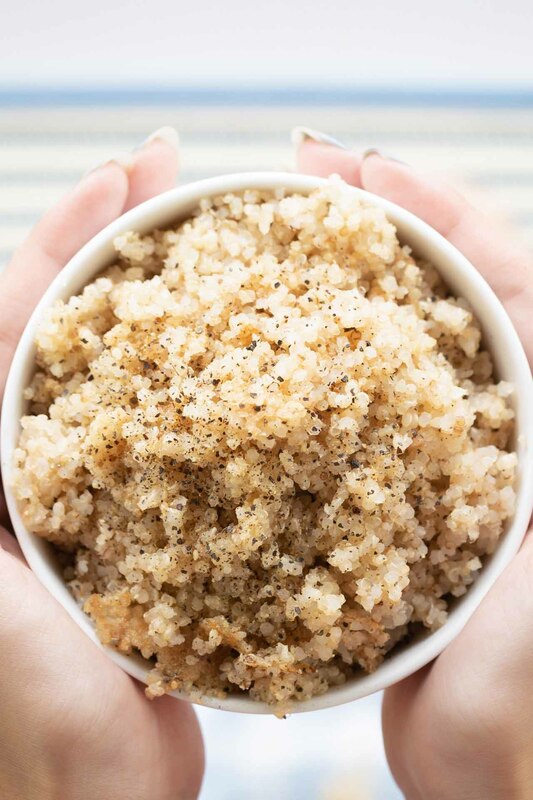 Quinoa is just plain fluffy after cooked, and the amount of cooked quinoa is approximately as 3 times of it as raw. So I don’t think there’s any case when you should double the mentioned amount in my recipe in a single saucepan. It’ll take you forever to cook it through properly. Apparently, a smaller amount of quinoa means shorter cooking time. But don’t get nervous just yet, it’s easy to estimate. You just have to rely on the boiling time plus check the quinoa’s fluffiness to decide on the heat reducing/removing point. Always remember to stir your quinoa up frequently throughout the cooking period. The ideal frequency is one proper stir every 5-10 minutes. This saves the final result from dryness, plus the pan’s bottom wouldn’t have to face being burnt. Besides, timing is (almost) everything. You take it out too soon, you’ll only get a soaked, undercooked quinoa. It’s called overdone the other way round. I bet you wouldn’t want to maul for either of that.